What began in 1988 as an effort to promote and recognize academic achievement is now a movement in thousands of schools across North America. The movement promotes and rewards student success. The movement is called Renaissance! Jostens Renaissance is an acclaimed educational enrichment program that is customized by each individual school community. Throughout the history of schools, recognition of achievement has played an important role. The St. Frederick High School Renaissance Program vision is inspired teaching and learning, increased academic excellence and increased enthusiasm for the pursuit of achievement. create a culture of celebration of all achievements to inspire success for the future. Students will earn a Renaissance card based on those criteria each nine weeks. If a student did not get a Renaissance card one nine weeks, they can apply the next nine weeks. This Program operates on a "nine weeks-by nine weeks" basis. Card levels are: Blue Card (all A’s) and White Card (at least a 3.3 GPA or higher; no C’s). The card will entitle students to perks and privileges reserved only for card holders. Application forms for the 2017-2018 SFHS Renaissance Program will be available to students about a week after the 1st nine weeks. A Faculty Advisory Committee member will check each application to ensure guideline adherence. 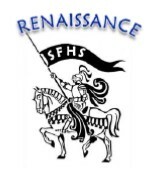 A SFHS Renaissance Program Pep Rally will then be held approximately 3 weeks after report cards are issued to recognize the 9th – 12th grade students who met the criteria of the Program. If you have any questions about the application process or how you can support the Renaissance Club at SFHS, please contact the front office. Thank you for your support of St. Frederick High School!